Earlier today we reported that 24 American breweries have signed on to a national Climate Declaration, calling for strong climate and energy policies in Washington. In keeping with that spirit, here are eight ways some of these breweries are innovating to reduce their environmental impact. Also be sure to check out this white paper on brewery watewater and spent grain management. Allagash Brewery, Brewery Vivant, Deschutes Brewery, Odell Brewing, Redhook and Widmer Brothers are all using 100 percent renewable energy to generate electricity. New Belgium Brewing and Ninkasi Brewing have installed on-site solar arrays, and Kona Brewing Co. gets 50 percent of its electricity with roof-top solar. Odell Brewing, for example, has installed rooftop solar panels that generate renewable energy for their brewing process. 2. Cutting energy use by recycling steam. Fremont Brewing and Odell Brewing are using steam from the brewing process to heat the next brew and lower their carbon footprints. 3. Sourcing local, organic ingredients. Many breweries are opting for local, organic ingredients when crafting their brews. Efficient T5 lighting systems with occupant and daylight sensors were recently installed at the Widmer Brothers Brewery. The brewery has reduced its energy use by 12 percent in 2014, to just 9.2 kWs per barrel of beer produced. Photo credit: Widmer Brothers Brewing. Breweries like Widmer Brothers Brewing have installed high-efficient lighting systems with occupancy and daylight sensors to reduce their energy use. Widmer Brothers brewery has reduced its energy use by 12 percent in 2014, to just 9.2 kWs per barrel of beer produced. New Belgium Brewing’s wastewater treatment bubble captures methane, the potent greenhouse gas produced from the treatment process, which is then used to provide 15 percent of the brewery’s electricity needs. Beer’s main ingredient is clean, fresh water. Breweries are increasing their water efficiency, especially in areas struggling with drought. Many breweries are cutting their transportation footprints by reducing packaging and choosing cans, which lighten the load. Guinness has partnered with the U.S. EPA Smartways program that works with transportation carriers to reduce carbon emissions through better logistics. The Alchemist lead brewer Jim Conroy of Waterbury, Vermont, moves a barrel of mash used to make Heady Topper. Photo credit: The Boston Globe. 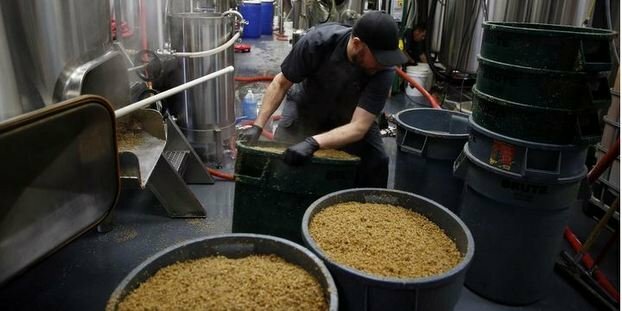 Breweries like The Alchemist are partnering with local farmers to reuse the spent grain from the brewing process as compost or to feed livestock. And remember, spent grain should be OK now, in the eyes of the FDA. For further sustainable brewing news, check out this story from a Michigan college that started an entire program for it. Kimberly Ann Spacy Grim liked this on Facebook. Douglas Ford Nipper liked this on Facebook. Ryan Hamilton liked this on Facebook. Cristina Grazia liked this on Facebook.